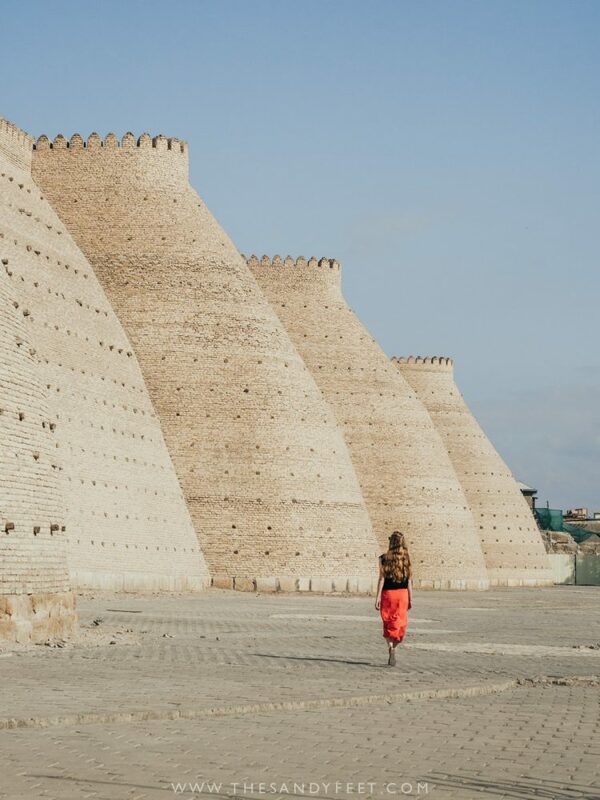 Along Uzbekistan’s silk road, Bukhara is another key character rising from the rolling saffron sands of the Kyzylkum Desert. 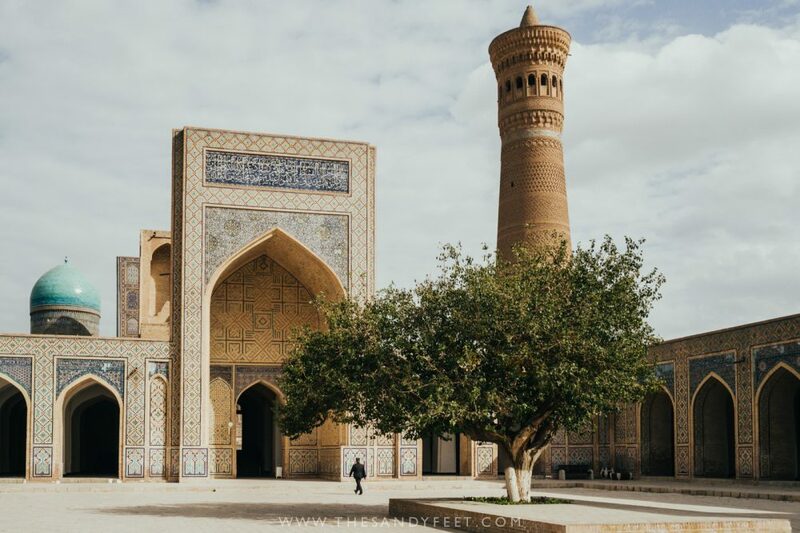 Set between the slightly chaotic scenes of Samarkand and the labyrinthine alleyways of Khiva, Bukhara is a happy medium. 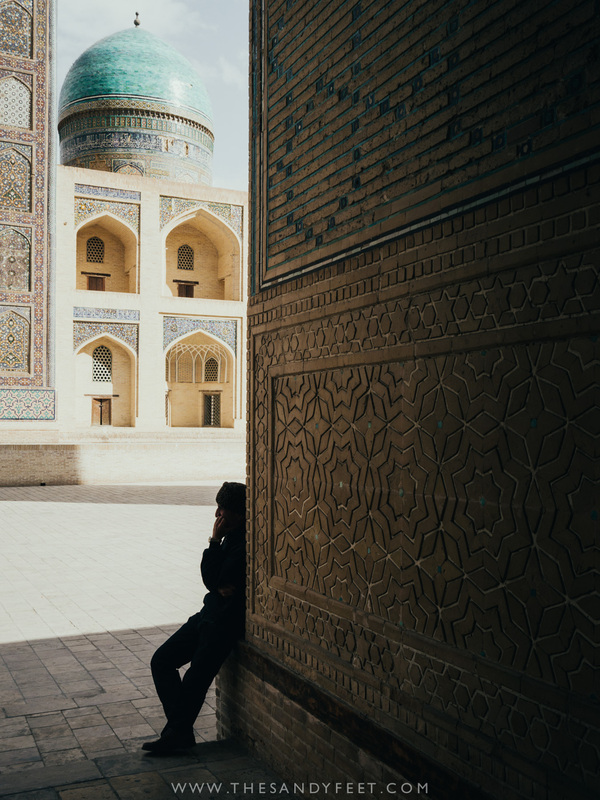 An ocean of mosques and minarets, ornate craftsmanship and intricate tilework, turquoise domes and leafy plazas peppered between the modern sprawl of the city. It’s a place that despite being heavily restored still feels very much lived in, and where the heaving tourist trade does not overwhelm the city streets. 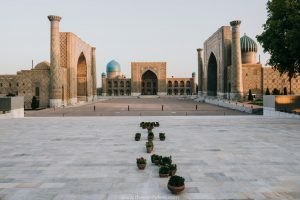 After the sometimes frenetic buzz that sweeps across elsewhere in Uzbekistan, Bukhara was a breath of fresh air and should be an essential stop on your Uzbekistan itinerary. 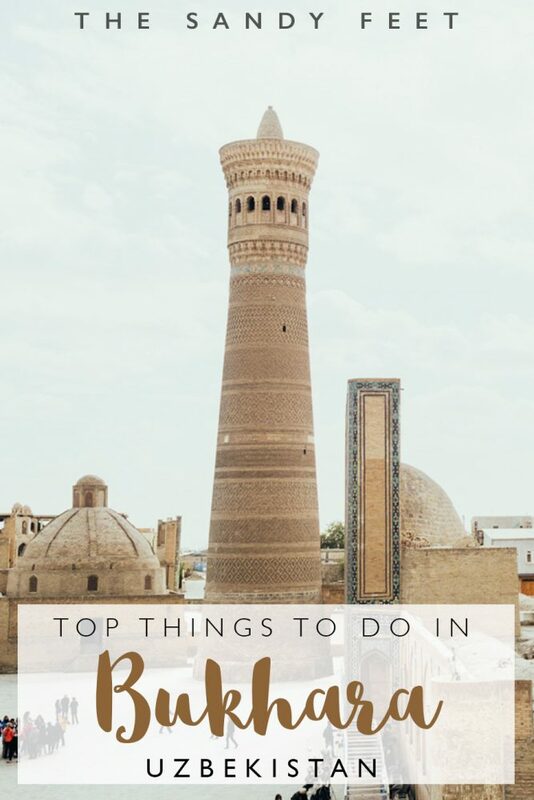 You can easily spend at least two days soaking up the city’s many sights and streets and these are our picks of the best things to do in Bukhara. 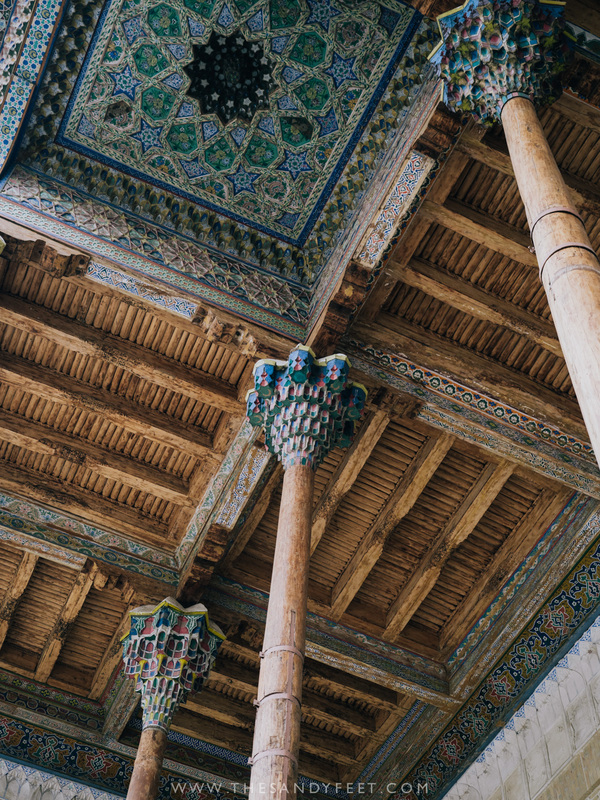 This leafy oasis in the heart of old Bukhara is a place of people watching and relaxation. The pool which makes a central meeting place in town is rimmed by quaint cafes that back onto mosaic-adorned madrassas and monuments. You’ll most likely pass through here a number of times during your visit so make the time to sit, wait and watch the world go by. When we visited in October, this curious network of markets was surprisingly empty, but it wasn’t hard to imagine the atmospheric clamour that must have filled these halls over the centuries. 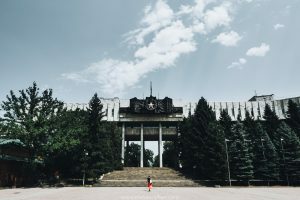 Unfortunately these days it is only souvenir stalls that spill over every surface, but if you’re looking for some mementoes to take back with you, this is a good place to start. The domed roofed bazaars are also a wonderfully cool place to escape to if you’re visiting in the sweltering heat of summer. 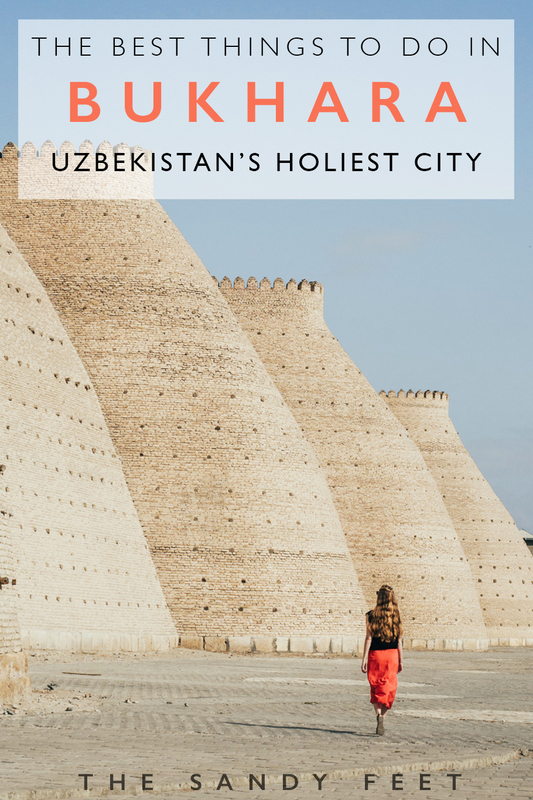 READ NEXT: THE BEST THINGS TO DO IN KHIVA | OUR FAVOURITE UZBEK TOWN! 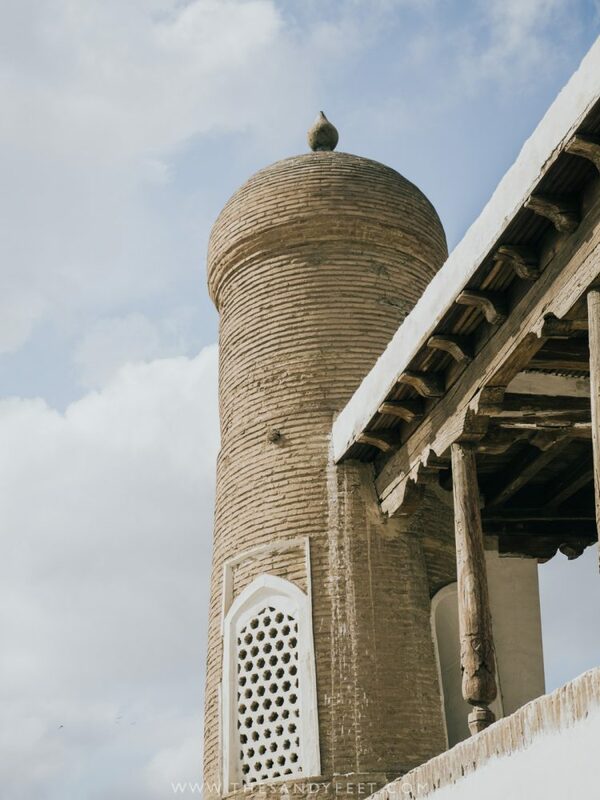 Kalon Minaret | If there’s something old-world Uzbekistan was exceptionally good at, it was designing minarets. Unlike many others which are dressed in bright colours, the sepia walls of Kalon Minaret are embellished with intricate brick patterns making it something incredibly unique. The structure has stood here for nine centuries, its beauty even causing it to be spared by Genghis Khan. 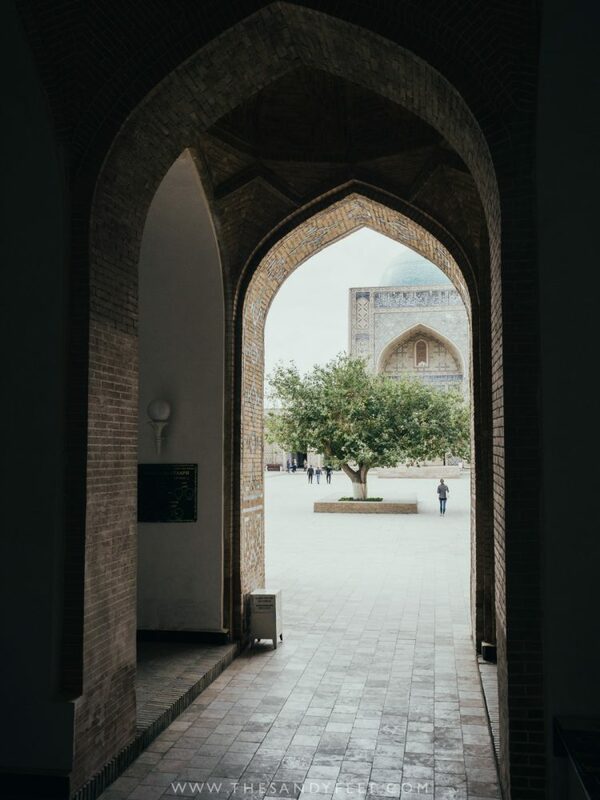 Kalon Mosque | This enormous space is one of few places along Uzbekistan’s silk road route not infiltrated by souvenir stalls, and the difference is stark. 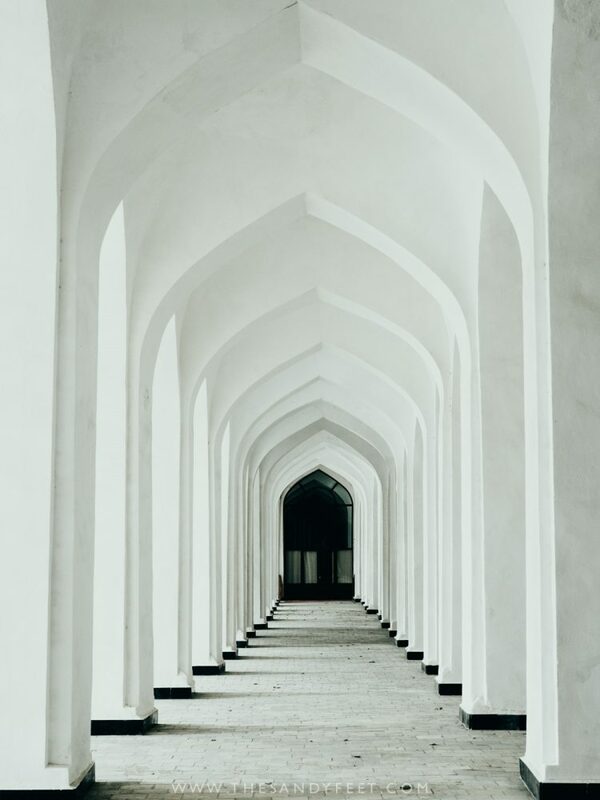 Still used as a house of prayer, peace and tranquillity bleed into every corner of the open courtyard and network of simple white archways that encircle the lonesome tree that stands in its centre. Away from the bustle found in other parts of the city, this quickly became our favourite place to visit in Bukhara. Entrance Fee | 7,000 som ($0.90) valid for 2 days. Only charged when there is an attendant on duty. 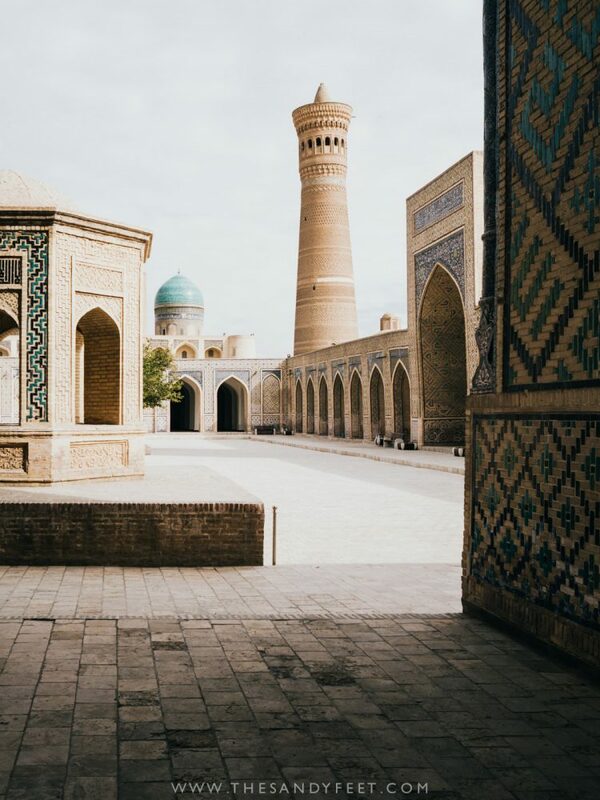 Mir-I-Arab Madrassa | The startling blue dome atop the Mir-I-Arab Madrassa is one of Bukhara’s most impressive sights. Unfortunately, tourists can only venture as far as the foyer from where you can gaze through the latticed window onto the central courtyard. 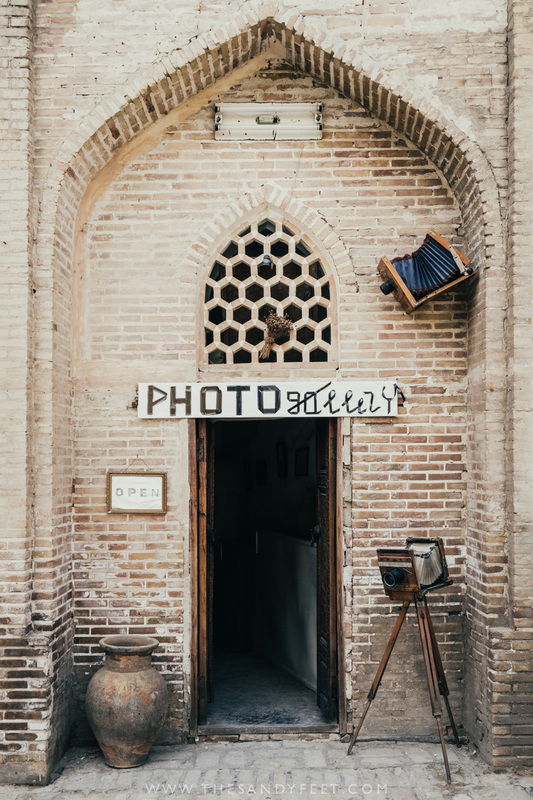 Tucked away in a small tree-shaded plaza off Jubar Street, this intriguing black and white photo gallery is free and well worth a visit in Bukhara. The striking imagery by local photographer Shavkat Boltaev gives a glimpse at the authentic side of Bukhara away from the tourist hoards and dressed up monuments, amidst a raging sandstorm or beneath a blanket of snow. 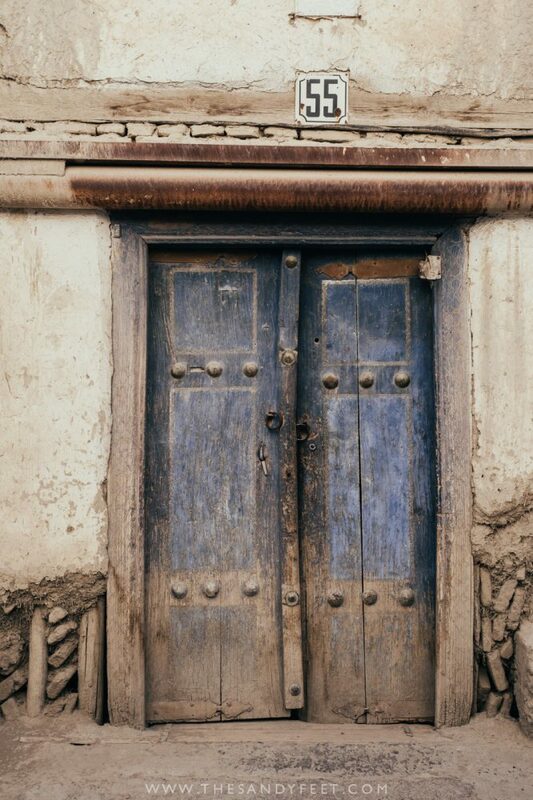 A surprising stop that will leave you mesmerised and curious to explore the city even deeper. Prints and postcards are sold inside and are a great way to support the gallery. Nestled amongst the rambling suburbs of Bukhara and away from the main historical complex lies charming little Char Minar, the four-domed temple that adorns the current cover of the region’s Lonely Planet. Inside is a crowded souvenir stand, but for a small fee you can climb to the upper level for decent views over the city. 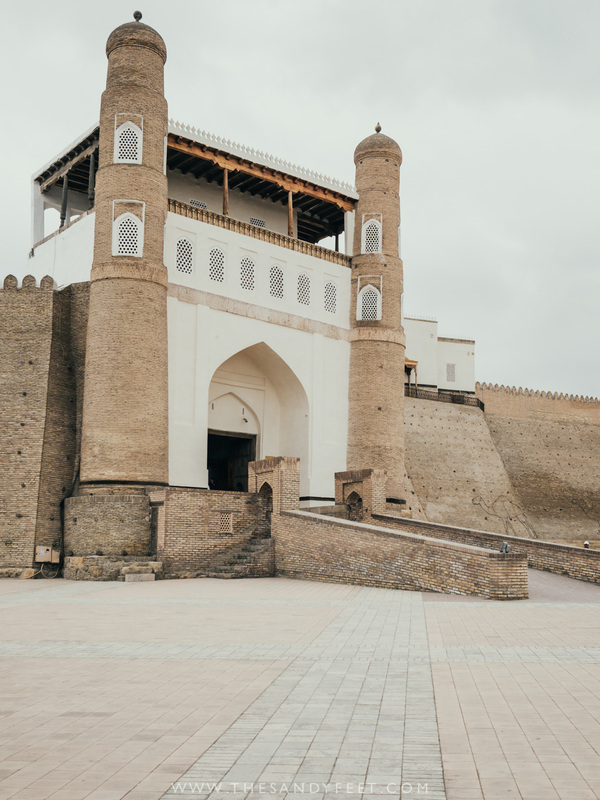 This enormous white washed military fortress that housed many of the ancient kingdom’s royals is Bukhara’s oldest structure and home to several museums. Admittedly much of the site was closed during our visit, though we found the undulating protective falls the most interesting part. 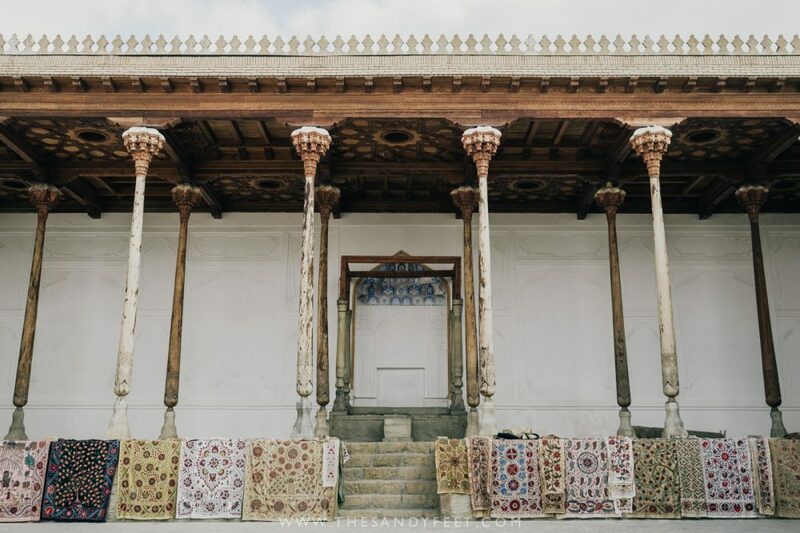 Just across the road, the wooden pillars and intricate ceiling of Bolo-Hauz Mosque present some interesting frescoes and is a worthwhile stop. Entrance fee | 15,000 som ($1.90) entry plus 5,000 som ($0.60) camera fee. Cafe Wishbone | Kind of a tourist trap. Yes. Delicious and exactly what we wanted. Absolutely! After months in Central Asia, what a delightful surprise it was to find a touch of traditional Germany in the heart of Bukhara. Sure, one serving is about the same as you’d pay for an entire meal elsewhere, but a slice of delicious apple strudel and hot chocolate on a cold autumn day was exactly what we needed. Rumour has it they serve a decent cup of coffee as well. Choose a seat on the lovely shaded terrace to enjoy the goings on around town. Address | Ulitsa Khakikat, in the open walkway between the covered bazaar and Poi-Kalyan Complex. Chashmai Mirob | This charming restaurant boasts a warm welcome and decent food, but the real reason to wander into this hidden haunt is the wonderful views overlooking the Poi-Kalyum Complex. Prices are unsurprisingly a little higher here than elsewhere in the city, but the fresh salads and speciality pumpkin manti were a welcome change after months of plov. 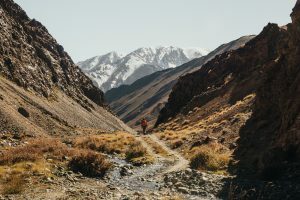 Though this place was completely empty when we rocked up in October, it’s a popular spot for large groups in the high season. Stop by for lunch or a sunset drink. Or check the latest reviews on TripAdvisor. 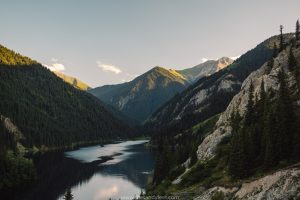 Chinar | This large restaurant serves up all the Uzbek staples including a wide range of salads and perfectly grilled shashlyk at a very reasonable price. 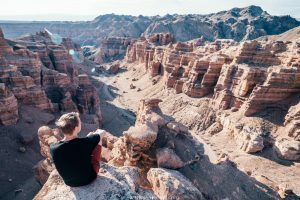 It’s popular with tourists and locals alike and we enjoyed it so much that we returned for both evenings in Bukhara. The eggplant salad, one of our favourite dishes in Uzbekistan, is particularly good. Salads start at around 10,000 som ($1.30) and shashlyk at 8,000 som ($1). 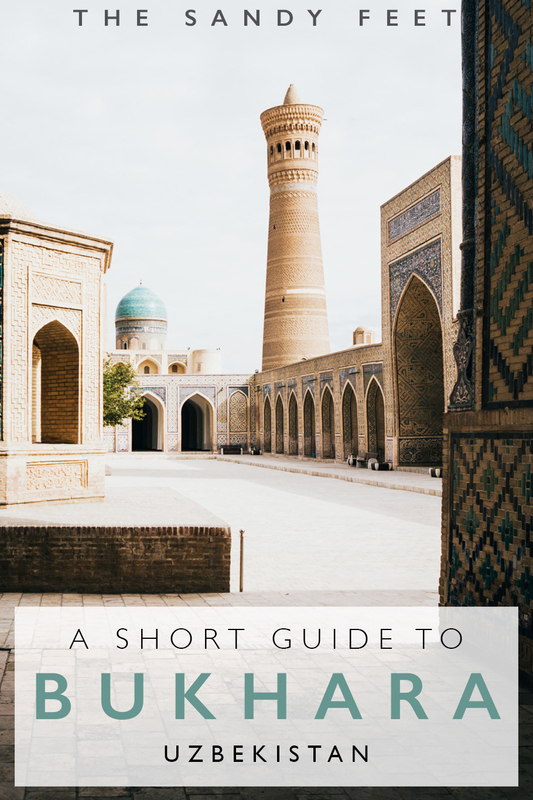 DON’T MISS: THE BEST THINGS TO DO IN SAMARKAND! 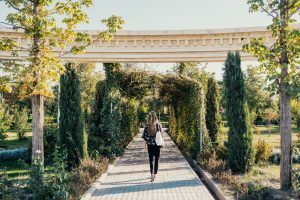 Rumi | A great budget-friendly option in Bukhara, this large family-run guesthouse is where we stayed and includes a delicious breakfast and is well located within a 5-minute walk of Lyabi Haus. There is also ample parking space for cyclists and those on a road trip across the region. Dormitory and private rooms are available. Search for rates and availability here or check the latest reviews on TripAdvisor. Serrafon B&B | This clean and cosy bed and breakfast makes an excellent base for exploring Bukhara. Set in a traditional house with authentic decor sprinkled throughout the property, a delicious breakfast and a great location, it’s no surprise Serafshon gets rave reviews from its guests! 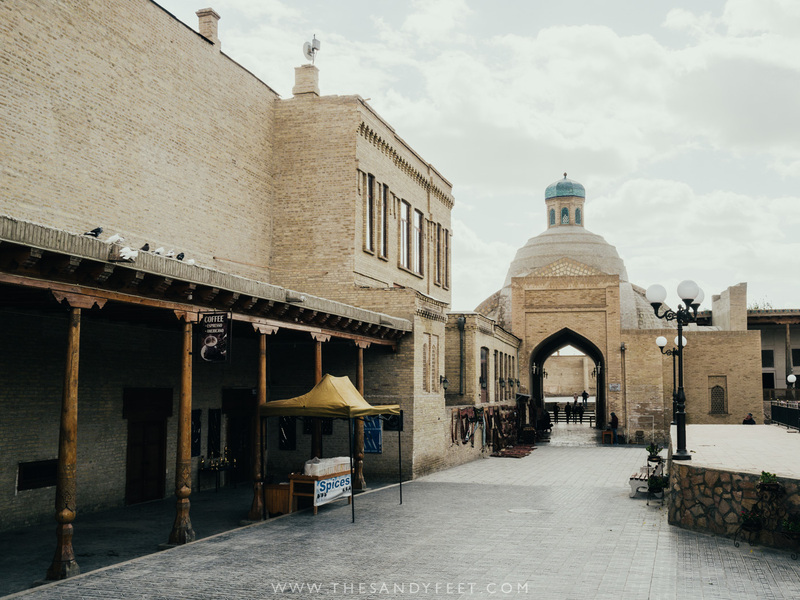 Lyabi Haus Hotel | Set right on the Lyabi Haus plaza in the heart of Bukhara’s historic centre, this beautiful hotel is a longtime favourite for visitors. Some rooms are a little time worn, but the exceptional breakfast and beautiful outdoor settings more than make up for it. 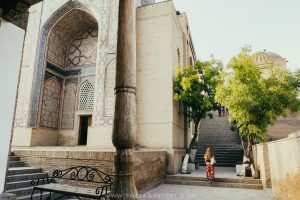 Despite being one of the main places to visit in Uzbekistan, Bukhara is not as well connected as you might expect. 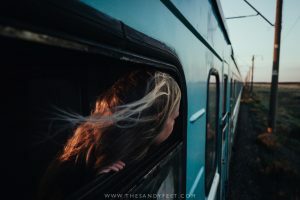 From Samarkand and Tashkent | Trains run several times daily between Tashkent and Bukhara via Samarkand taking just under 4 hours on the fast train and slightly longer on the old Soviet trains. Prices start at 59,000 som ($7.50) for a seat in third class on a slow train and go upwards from there. 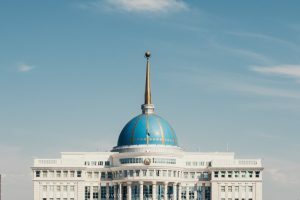 You can now search train tickets and timetables on the Uzbek Railway website. 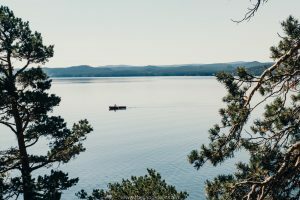 By entering your start and end destinations in English, the relevant station will appear in Cyrillic so be sure to choose correctly. Uzbekistan Airways also travels between Bukhara and Tashkent most days with prices starting at $32 for the 1-hour flight. 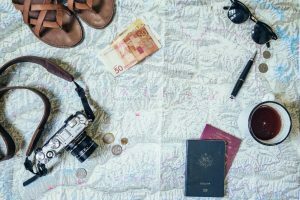 Search for the best flight deals here. 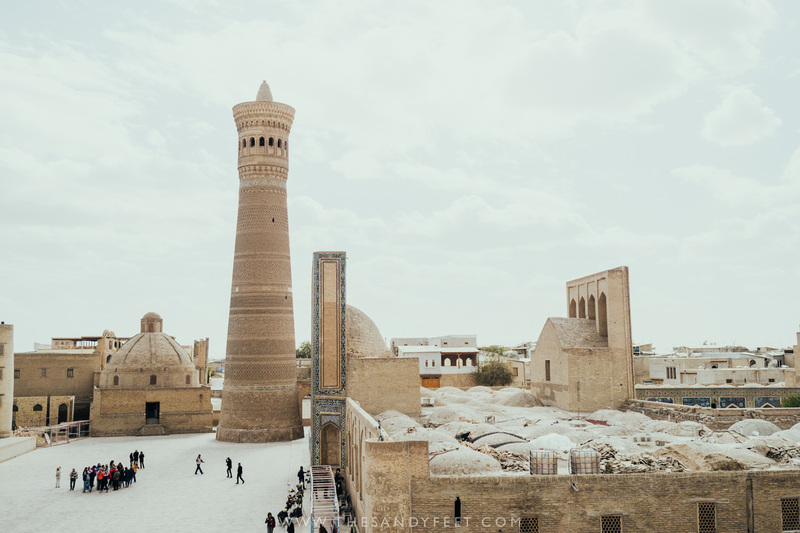 From Khiva | Getting between Khiva and Bukhara by train is possible but involves a rather inconvenient late night connection in Navoi and switching to a taxi in Urgench for the final leg to Khiva. Instead, we’d recommend taking a taxi between the two cities. A shared taxi of 4 people generally costs around 100,000 som ($12.50) per person and takes around 6 hours depending on the craziness of your driver. Your guesthouse should be able to organise this for you and put you with fellow travellers going the same route. 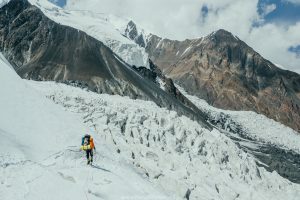 In high season, there should be no shortage of other travellers zipping between these cities, but in the dead of winter it may be a different story. 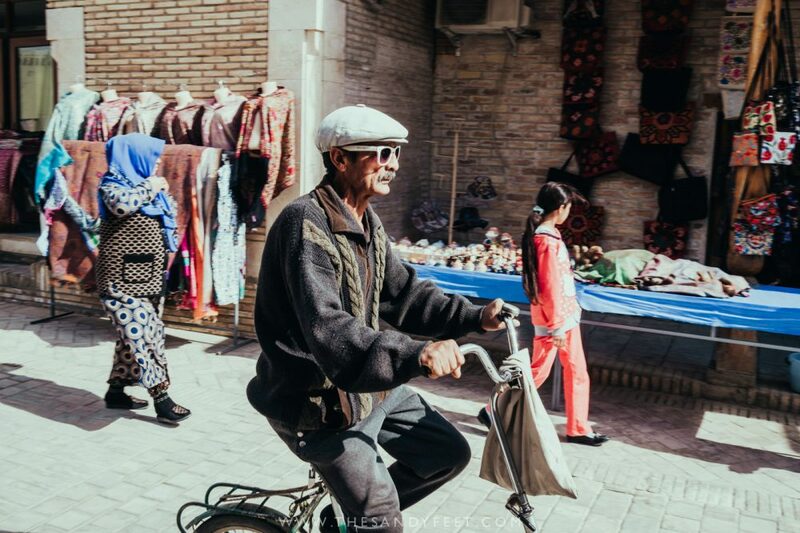 Another option is to head to Karvon Bazaar about 5 km from the centre of Bukhara and find a shared taxi to Urgench here. Prices work out about the same.